The ability to sign your name is one of the best reasons to learn cursive writing. Even with all the digital ways you can dodge handwriting, often one needs to “sign the pad” for a transaction. So what do you do? Scribble or print? Your signature or your “John Hancock,” as it is sometimes referred to, is a calling card of sorts. Your written name symbolizes who you are, and it is legal proof of your identity. The inability to sign one’s name can create embarrassment, or even shame for an individual. Putting an “X” on the signature line may appear like handwriting illiteracy. Teaching cursive writing was removed from the public school curriculum in 2009 with the introduction of the National Common Core Standards. Leaving it up to the states and municipalities to decide, most public schools in the U.S. do not teach cursive handwriting. The student learns to print, and then by 3rd grade one transitions into keyboarding. Having computer skills is considered paramount. Knowing how to type and how to navigate the computer is where public education is focused. However, there is an outcry from both the teachers and the students to bring back cursive. The school administrations are the deciding factor. My concern is with the all or nothing approach that the digital culture advocates. Why not have a choice, a different option to express different sentiments? Computer type offers an impersonal sameness and no visual indication of the author’s personality. That would be useful in business. Whereas, when something is handwritten, the uniqueness and character of the writer shine through, which would enhance one’s personal communication. Anne Trubek in The History and Uncertain Future of Handwriting suggests that perhaps handwriting could be taught in an art class. Handwriting is a most practical life skill to learn in whatever classroom it is taught. True, some students will be challenged, especially the “lefties.” But like learning any skill, the effort pays off. Having the ability to hand write makes note taking, list making, journaling, second nature. And the brain retains material more easily once it is written down. The possibilities are endless. 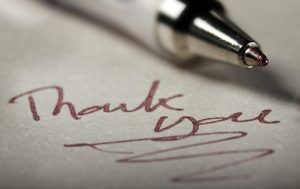 Why you might even find yourself quickly writing that thank you note, instead of procrastinating. Anne Trubek, The History and Uncertain Future of Handwriting, (New York:Bloomsbury,2016)150.